Inflation targeting means Central Banks are responsible for using monetary policy to keep inflation close to the agreed target (usually around 2%). 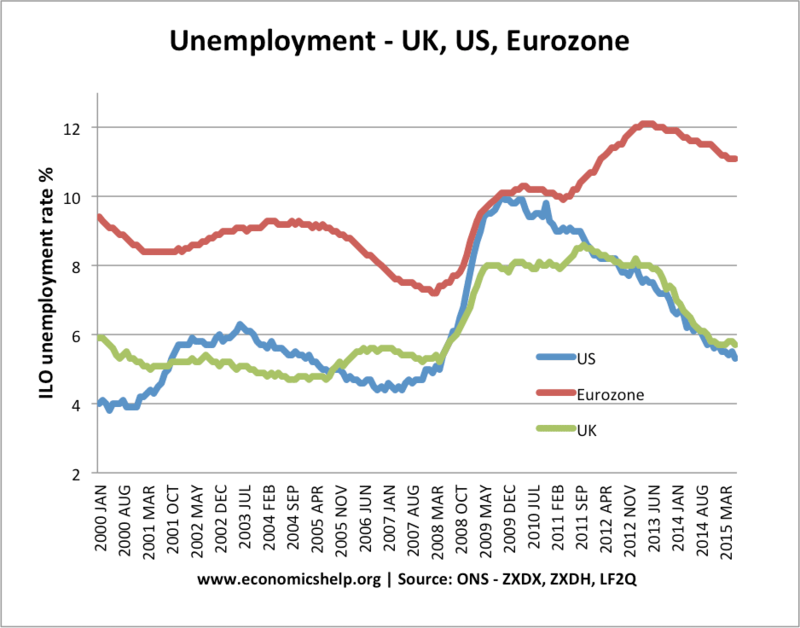 Since the mid-1990s, inflation targeting has become widely adopted by developed economies, such as UK, US, and the Eurozone. Inflation targets were introduced to help reduce inflation expectations and help avoid the periods of high inflation which destabilised economies in the 1970s and 80s. However, since the recession of 2008, economists have begun to question the importance attached to inflation targets and are worried that a strict commitment to low inflation can conflict with other more important macroeconomic objectives. The US Federal Reserve has a dual target to keep long-term inflation at 2% and maximise employment. Credibility / Expectations. If an independent Central Bank makes a commitment to keep inflation at 2%, people will tend to have lower inflation expectations. Low inflation expectations make it easier to keep inflation low. It becomes a self-reinforcing cycle – if people expect low inflation, they don’t demand high wages; if firms expect low inflation, they are more conscious of increasing prices. WIth low inflation expectations, smaller changes in interest rates can have a bigger effect. Clarity. An inflation target provides clarity for monetary policy. Alternatives have been tried with less success. For example, in the early 1980s, monetarism suggested trying to target the money supply – but this indirect targeting of inflation proved limited as the link between the money supply and inflation was weaker than expected. Cost-push inflation may cause a temporary blip in inflation. 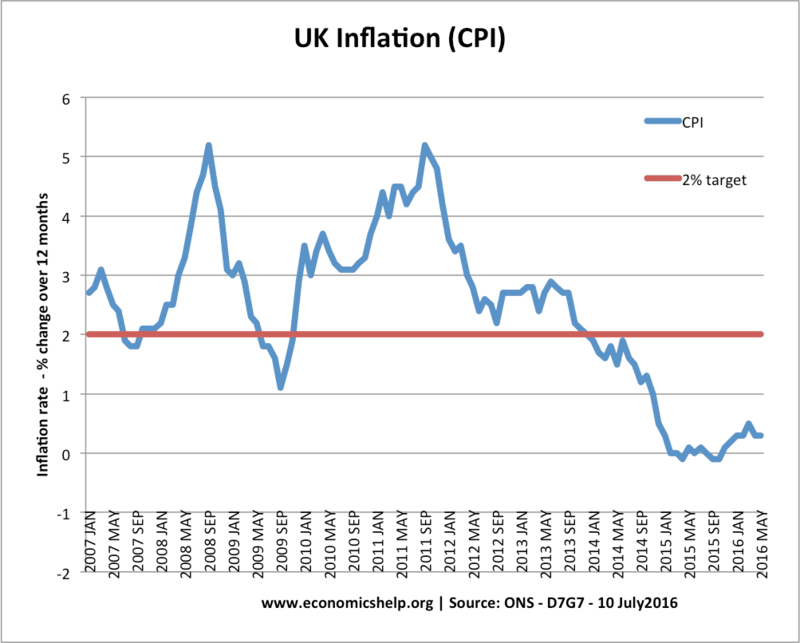 Just before the recession of 2009, the UK experienced cost-push inflation of 5% due to high oil prices. To target 2% inflation would have required higher interest rates, which leads to lower growth. Some economists argued interest rates should have been cut earlier, and inflation targets were a reason for the delayed easing of monetary policy. To some extent, the UK and US are willing to tolerate temporary deviations from the inflation target. The Bank of England allowed inflation to be above target during 2009-2012 because it felt the inflation was temporary and the recession was more serious. However, the ECB have shown greater inflexibility and unwillingness to tolerate temporary blips in inflation. For example, in 2011 the ECB increased interest rates, despite low growth because they were concerned about inflation. The ECB then struggled with deflationary pressures. 2. Central Banks start to ignore more pressing problems. The ECB set monetary policy to keep inflation in the Eurozone on target. Yet, by targetting inflation, they appeared to be downplaying the costs of rising unemployment. In 2011/12, the ECB seemed remarkably unconcerned about the Eurozone’s slide into a double-dip recession. 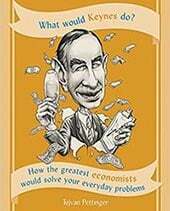 Rather than trying to prevent a prolonged slump, they were fixated on the importance of low inflation. 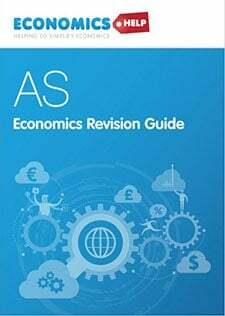 Inflation above target can impose costs on the economy such as uncertainty, loss of competitiveness and menu costs, but arguably these costs are much less significant than the social and economic costs of mass unemployment. Unemployment in Spain reached 25%, but there was little monetary stimulus in the Eurozone because the ECB is worried about inflation at 2.6% – This is giving low inflation too much priority in times of a recession. 3. Sometimes you need a higher inflation rate. This point is controversial, but in a liquidity trap, some economists, such as Paul Krugman argue that it can be necessary to target a higher inflation rate – to help overcome deflationary pressures. For example, in 2012, Germany had a current account surplus of 6%. Yet, Southern European countries had a large current account deficit and lack of competitiveness. To restore competitiveness, Southern European countries are pursuing deflationary policies which are risking recession and deflation. If Germany had higher consumer spending and higher inflation, then this would make the readjustment process in the Eurozone less painful. 4. Inflation targets are limited. Inflation targetting successful in keeping inflation low. 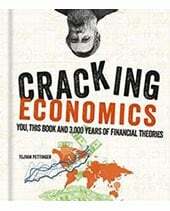 The low inflation in the early 2000s – suggested a balanced economy – but there was a credit bubble, housing bubble and rise in consumer spending. 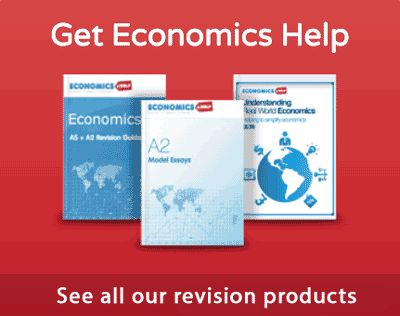 After the 1992 recession, the UK had a long period of economic expansion and low inflation. This suggested inflation targeting was very successful in avoiding inflationary booms. To some extent this was true. However, the low inflation disguised an asset and banking boom and bust. This isn’t so much a criticism of inflation targeting, but it is a clear limitation. Low inflation doesn’t mean the economy has an underlying stability. 5. A large output gap doesn’t necessarily lead to deflation. 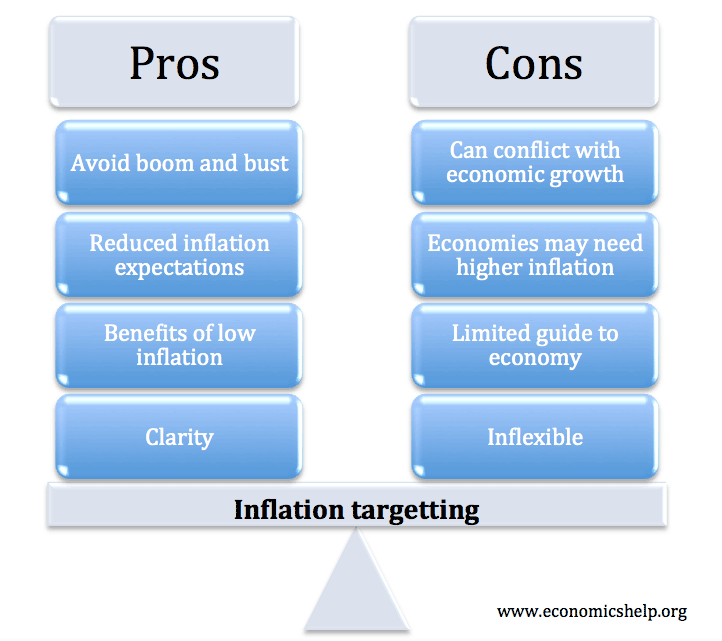 Inflation targets can have various benefits, especially during ‘normal’ economic circumstances. However, the prolonged recession since the credit crunch of 2008 has severely tested the usefulness of inflation targets. There is a danger that Central Banks give too much weighting to low inflation when there are a much more serious economic and social problems such as unemployment. One solution would be to give an equal weighting to an inflation target and output gap target. 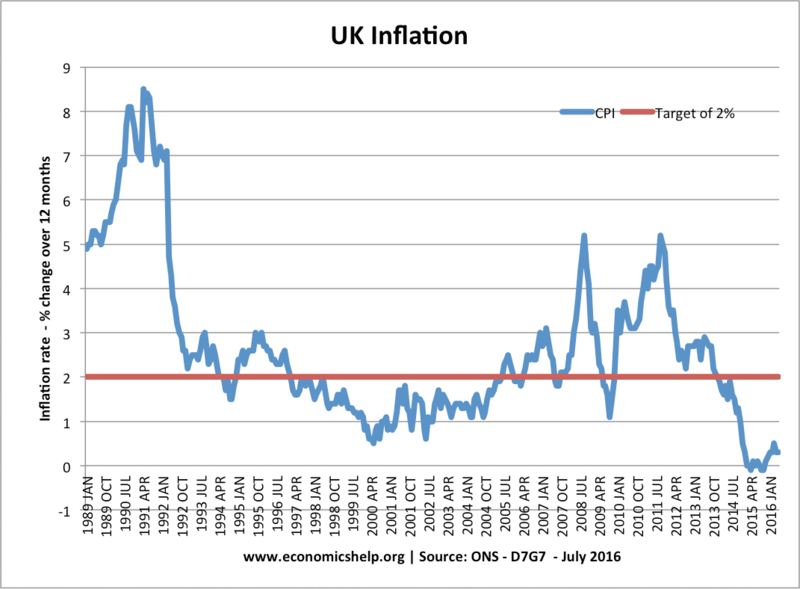 The UK and US do actually have this dual target, though the inflation target often seems to be given the highest importance – because it has the greatest visibility. My bigger criticism rests with the ECB (which has only a single mandate for low inflation). In the past, they have given the impression of under-estimating the economic cost of prolonged unemployment and a persistent output gap in the Eurozone. Furthermore, given the structural problems of the Eurozone, it is even more important to have flexibility in the inflation target within the Eurozone. The ECB argued that if they change their inflation target, they will lose credibility. But, this indicates they feel inflation is the main criteria for judging monetary policy. There also needs to be credibility in reducing unemployment and promoting economic growth. I have nothing against inflation targets if the Central Bank gives as much importance to the dual target of unemployment/output gap. Also in exceptional times – liquidity trap/recession – there needs to be more flexibility on inflation – and a willingness to tolerate higher inflation, where necessary. In certain circumstances – it may even be necessary to increase the inflation target. Thanks for this – i have found it to be very useful. How is the inflation target implemented. Is it by tweaking money supply in the money market? 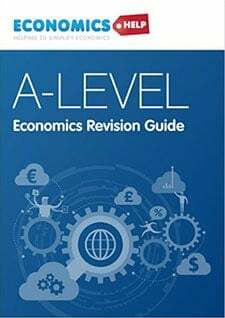 Any paper that explain how interst rates afect price levels? Thanks ! !